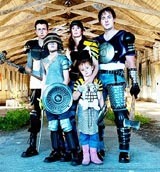 The Family That Slays Together Stays Together | We Zombie! 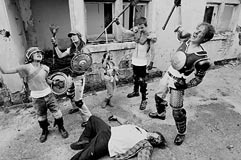 Ivan Owen makes armor, props, and other accessories in his spare time, and one of his recent projects involved making zombie fighting armor for his entire family. His wife﻿﻿﻿﻿ had only one request for her birthday this year; she wanted to do a post apocalypse zombie slaying photo shoot, so what else could he do? Check out the full set of pictures on his blog, ChainCrafts. I caught up with Ivan on email and asked him a few questions about the project – what follows is an interview that transpired through email over a couple of days. WeZombie: Hello Ivan, and thanks for taking time to answer some questions for us. Did you know what you were getting into when you agreed to do the project? I read that it was your wife’s birthday wish to have a Post-Apocalypse/Zombie Slaying family photo shoot, but seriously, every year on my wife’s birthday, she always asks me to build the same thing – an underground, self-sustainable zombie shelter stocked with food and weapons. But do I indulge her? No! So, what were your thinking? WZ: Once you agreed to the project, what went through your mind? Were you thinking about how and where you would find the materials? How you would pay for it? How long it would take? Tell us exactly what you were thinking once you knew you were committed to the idea! IO: I started thinking about materials and cost right away. The central idea was to make as much of it as possible out of scrap materials. Jen (my wife) and I made a plan to rummage through local thrift stores, a used construction materials store and even a scrapyard to find what we needed. 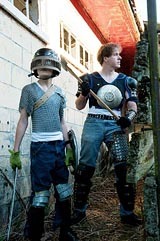 We set aside a budget of $75 ($15 per person) for the armor, and we ended up keeping it under that amount. As soon as I was committed to the idea, I had a pretty good notion of how long it would take. I’ve been building custom projects for clients for over a year now, so I can usually estimate time lines. I figured it would take a month to complete in the scraps of time I had available between my day job, taking care of my kids and the custom projects I had for my clients. Most of my thoughts right after committing to the idea centered on my excitement for the project and designing bits of armor in my head. WZ: I love the squirrel cage being used as head armor on one of your children – that’s fantastic, and effective I might add. What were some of the most unusual materials that you wound up using in the project ? IO: I think the most unusual materials I used were: 1.) a genuine Railroad Crossing sign that my wife found at an antique shop. I used it to make the shoulder armor for my wife and daughter. 2.) A broken, chrome running stripe from a ’36 Chevy truck (It was used to make a sword for our middle child). WZ: How did you get started making armor, and more importantly, why? IO: I started making armor around the age of 16 or 17. One of my former girlfriends, an awesome lady named Cassie, gave me my first role of 16ga. steel wire and taught me how to make chainmaile. I wanted to make armor because I’ve always been really interested in fantasy themed books, movies and computer games. I eventually decided that, instead of just imagining the armor in said media genres… I wanted to actually create it. WZ: How did you find the location for the photo shoot? It’s very apocalyptic and reminds me of home. IO: The location of the shoot was Northern State Mental Hospital in Sedro Wolley, WA. It’s about 45 min from where we live. My wife’s favorite subject for her photography is urban decay & she heard about the hospital from an acquaintance of hers. The part where we took pictures was the dairy farm the patients used to operate and it’s been abandoned for over 30 years! Makes for an excellent desolate, broken and mildly creepy background. WZ: You’ve been very successful with your creativity. What would you say to those artists out there who are trying to be successful, whether it be writing, drawing, sculpting, or some other creative aspiration? IO: Well… I’m not super successful (I still have to hold a day-job) but I’m starting to get more and more paid work involving my art. My philosophy has always been to, whenever possible, pursue whatever crazy ideas my mind presents to me as well as joining other artists when they invite me to assist them with their crazy ideas. 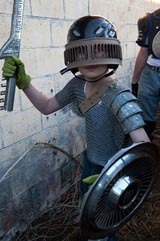 Whether it’s building apocalypse armor, helping to create a demon for a short film, building and playing bizarre musical instruments, or even just drawing doodles with my daughter… I’ve always found the projects that I end up involved in to be both fun and a great source of new knowledge and skills. I guess as long as you’re enjoying your art and you can share that enjoyment with others, then the artistic process has been successful. It turns out that Owen is pretty talented – a couple of years ago he authored a music CD and these days continues to craft unique armor, chainmaile, and other cool things. He has a store on Etsy and right now he is having a Halloween sale to make some room for some of his latest projects. Help him make room – there must be something you need! 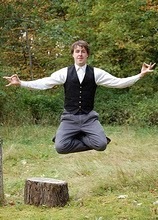 This entry was posted in Commentary, Interviews, Products. Bookmark the permalink.